While scrolling around the internet one day I saw this dish that made my mouth water. 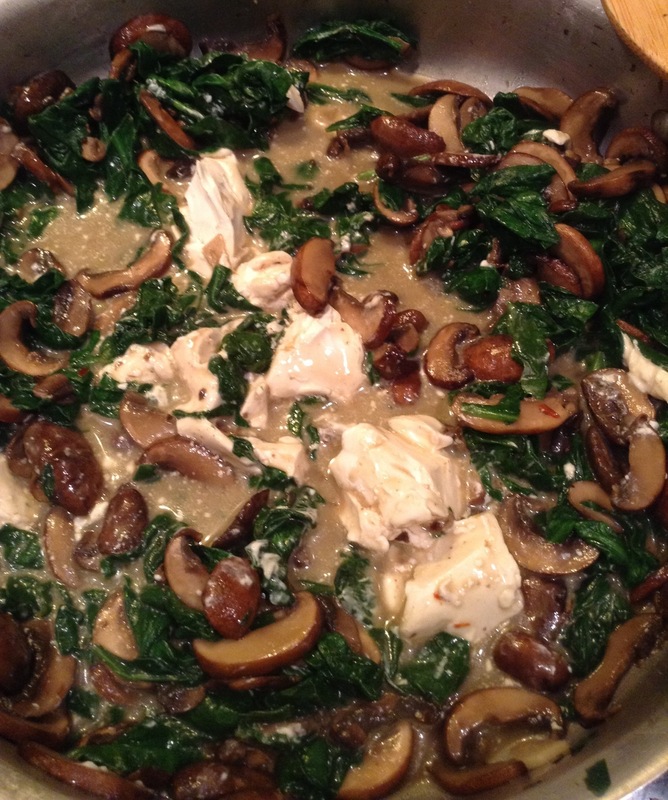 It incorporated two of my favorite foods…mushrooms and spinach! I was so excited to go home and try it. Then I read the ingredients and saw cream of mushroom soup. I really try to avoid processed and canned goods when cooking for my family so I decided to create a fresh version. 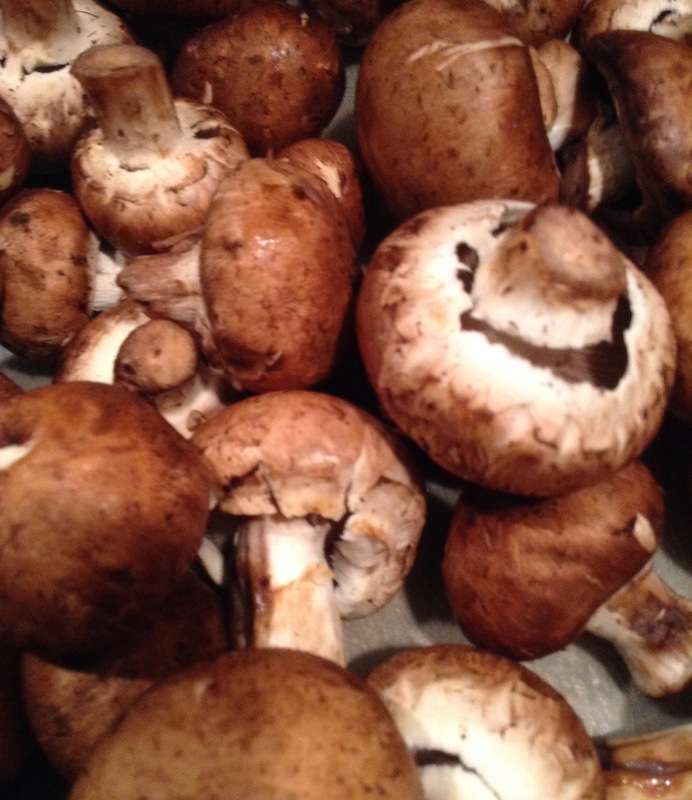 Just look at these beautiful cremini mushrooms! These are definitely the star of the dish. 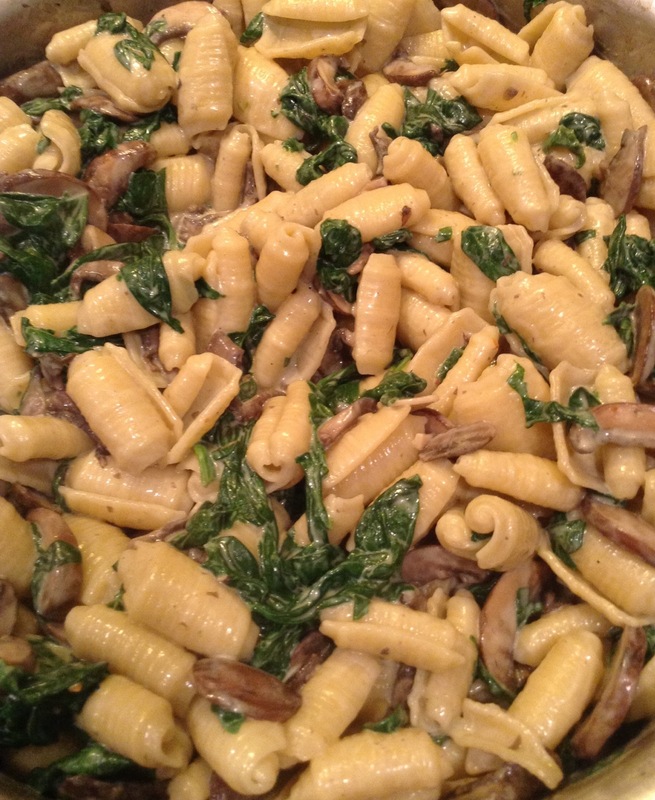 Any mushrooms would work, but I love the earthiness of cremini mushrooms. There are about two pounds here. 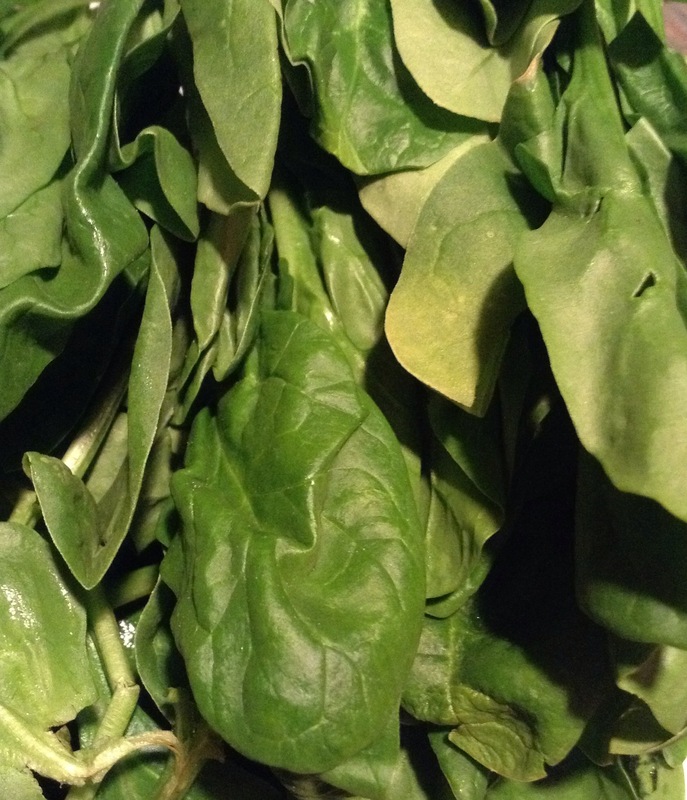 This gorgeous fresh spinach is the costar. I think kale, swiss chard or escarole would also work very well. Two large bunches will go into the dish. 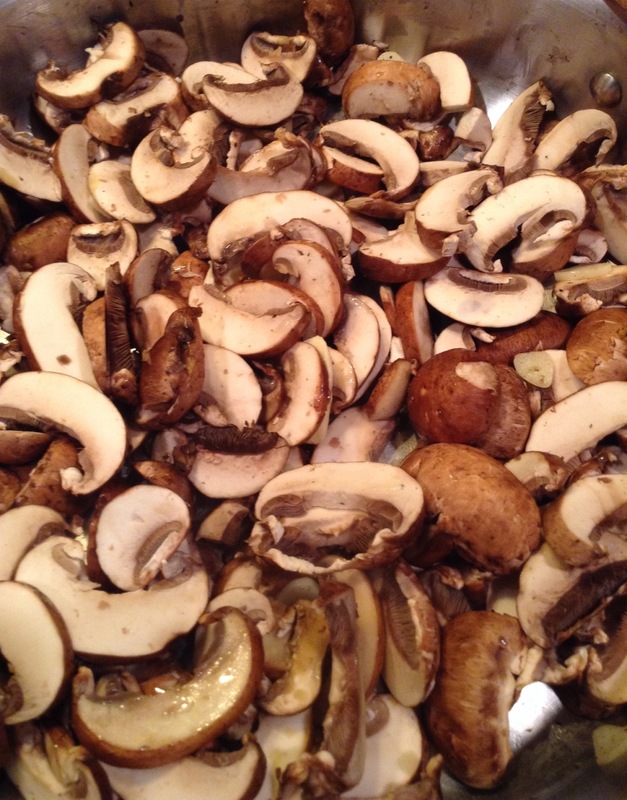 To start, make mushroom stock. 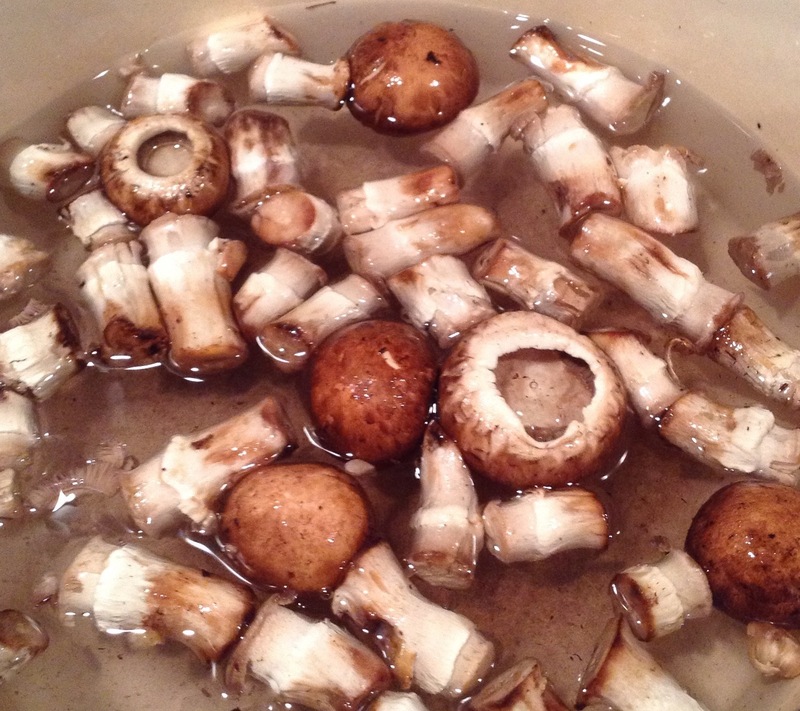 In your favorite stock pot, take the stems and a handful of mushrooms and add four cups of water. Boil for ten to fifteen minutes then reduce to a simmer. 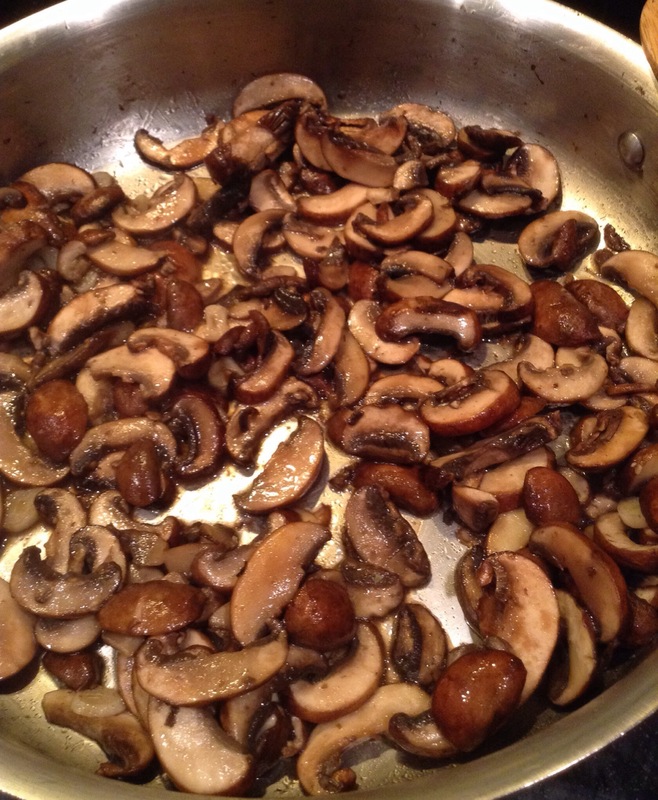 Making your own mushroom stock really adds flavor to the dish. Slice all of the mushrooms. 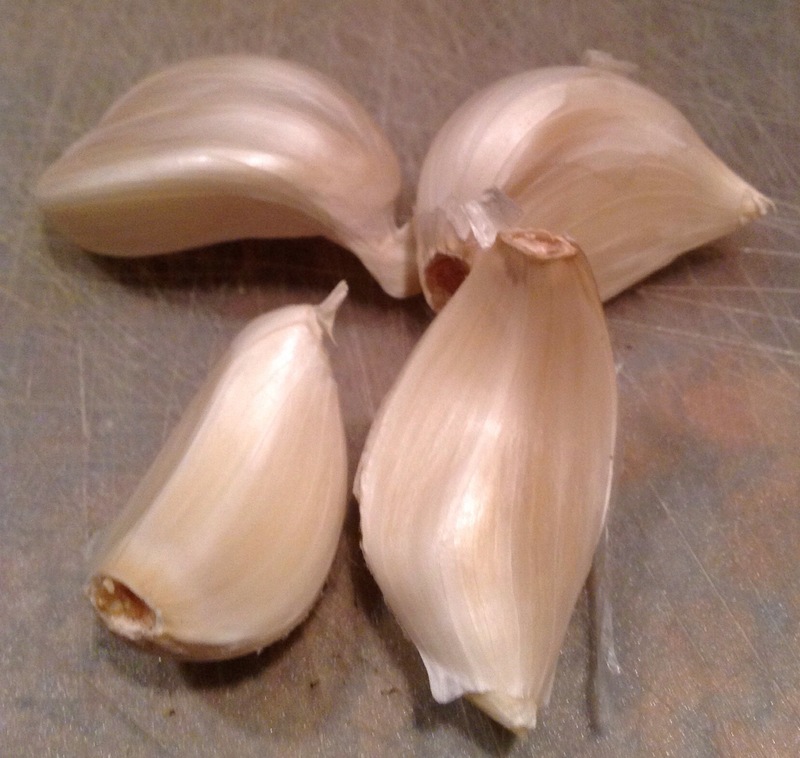 Also slice four cloves of garlic. Heat a skillet over medium heat, add in one tablespoon of extra virgin olive oil and one tablespoon of dairy free butter. Feel free to use regular butter if you prefer. Once the butter is melted, add in the mushrooms and garlic. 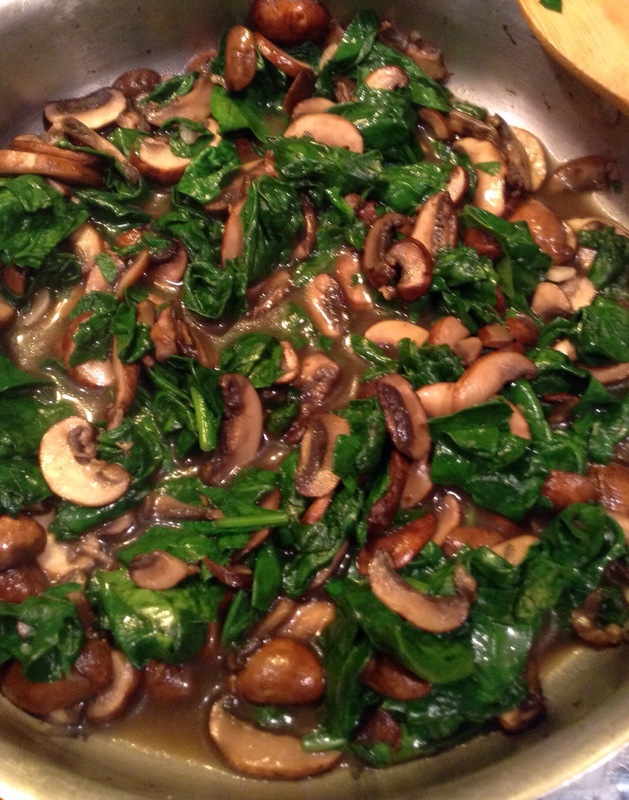 Once the mushrooms have browned nicely, add the spinach to the skillet. Season with salt, pepper and red chili flakes to taste. 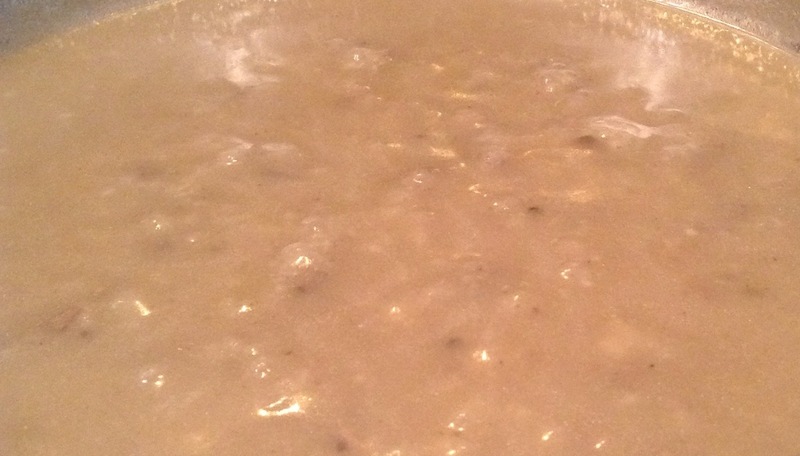 Pour one cup of the mushroom stock into the skillet. 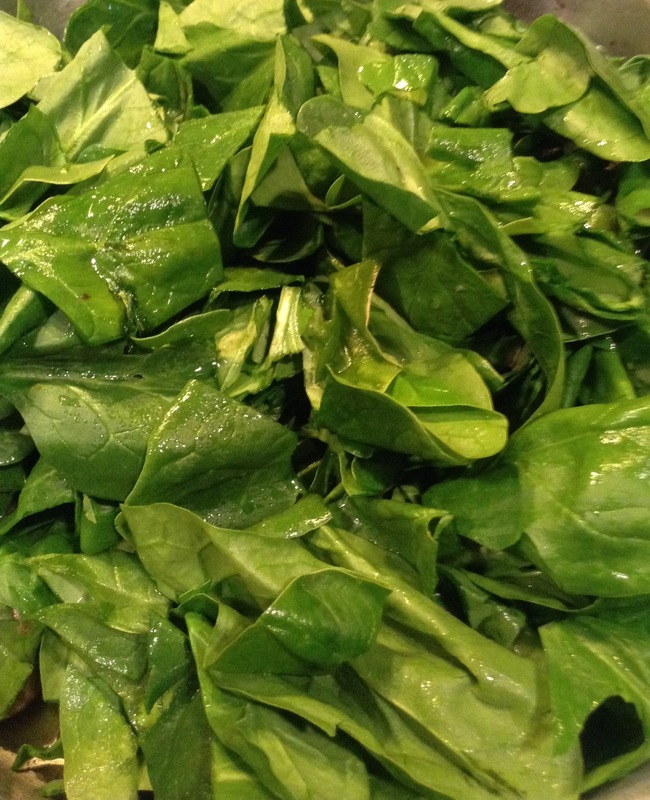 Simmer until the spinach wilts. At this point, add in four tablespoons of dairy free cream cheese. Goats cheese or full dairy cream cheese would also work nicely. Sprinkle generously with nutritional yeast. Stir until melted and well combined. While preparing the sauce, the pasta should also be cooking. 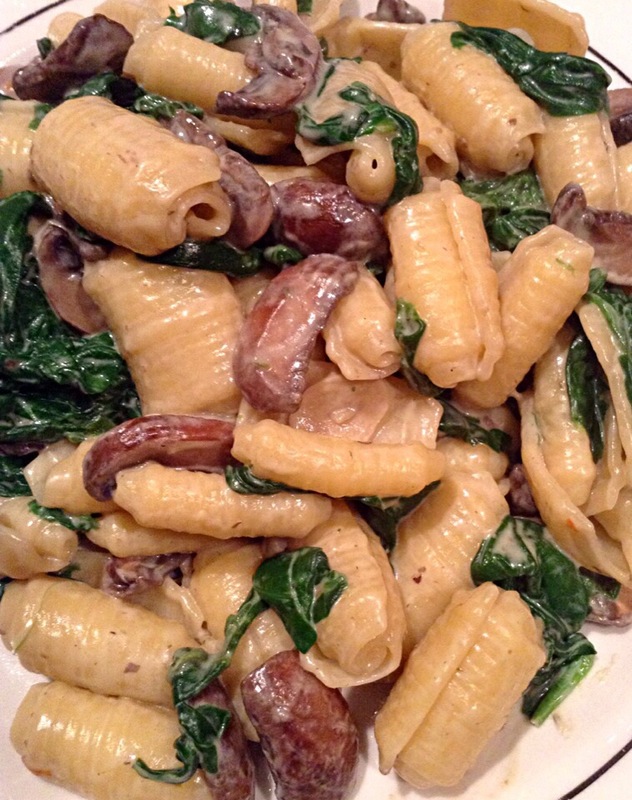 For this dish, barilotti was grabbed out of the pantry because it would hold the sauce well. Once the pasta is al dente, strain and toss into the sauce. Serve all on it’s own or with some crusty italian bread. This is a great week ugh dish because it comes together so quickly. In about thirty minutes, a healthy and delicious meal is on the table! Most people cook their Thanksgiving meal on Thanksgiving; however, that is not the case in our house. Visiting with family on Thanksgiving does not allow us the time to cook our own Thanksgiving meal. Not having leftovers is a travesty in my opinion! The tradition has become to create our Thanksgiving meal the weekend after Thanksgiving; allowing us time to enjoy Thanksgiving with family and have our own leftovers for fun creations. This year we decided to try something a little bit different. 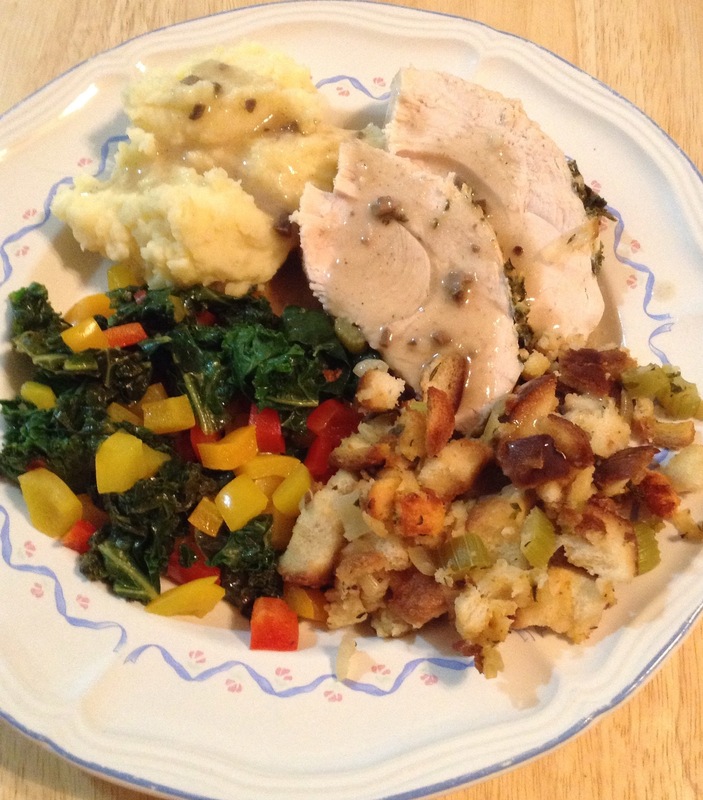 A simple gremolata was made for under the skin of the turkey breast. Save a little to rub into the outside of the turkey as well. This should infuse both flavor and moisture into the breast meat. 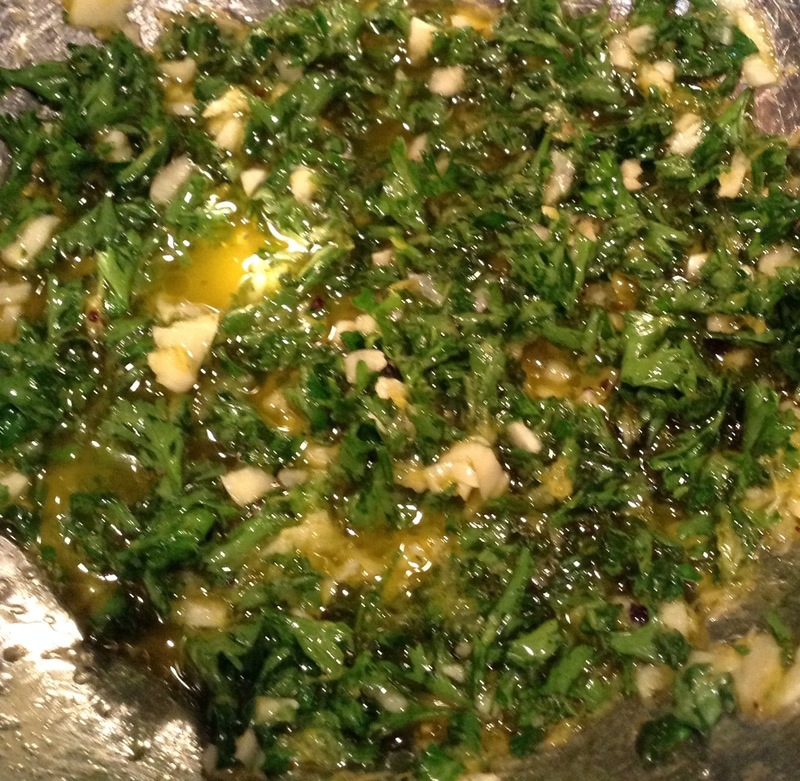 For the gremolata, combine four cloves of diced garlic, a handful of chopped fresh parsley, the juice and zest of one lemon and a few tablespoons of extra virigin olive oil. Allow to sit for at least an hour for the flavors to marry. 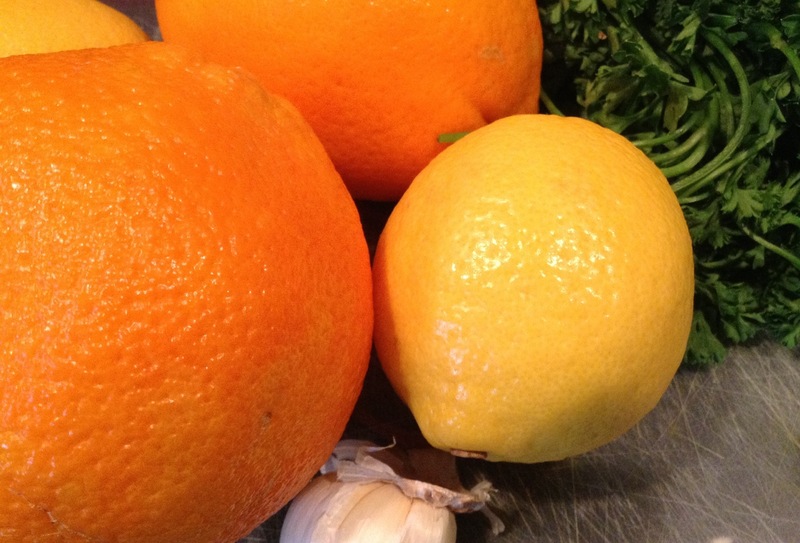 Into the cavity place six cloves of garlic, two oranges, two lemons and a generous bunch of parsley. The flavors inside are very similar to the gremolata outside. The oranges and lemons were halved. Of course, both the inside and outside of the bird got a generous coating of salt as well. The turkey is now ready to go in the oven. 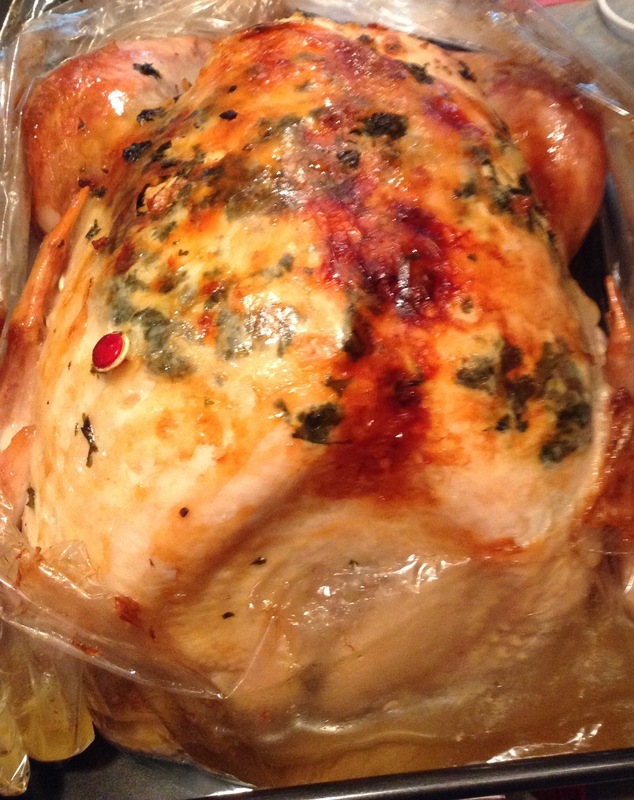 We start ours covered in aluminum foil so it doesn’t brown to quickly on the outside. Into a 350* oven it goes. Time varies depending on size. Our twenty pounder cooked for two and a half hours with the foil and an additional hour and fifteen minutes without the foil. Look how beautifully brown the turkey comes out of the oven. It was decided to attempt a giblet gravy this year. Usually the giblets are thrown away because they are scary, but this year it was decided why not? While the turkey cooks the giblets will be simmering away. 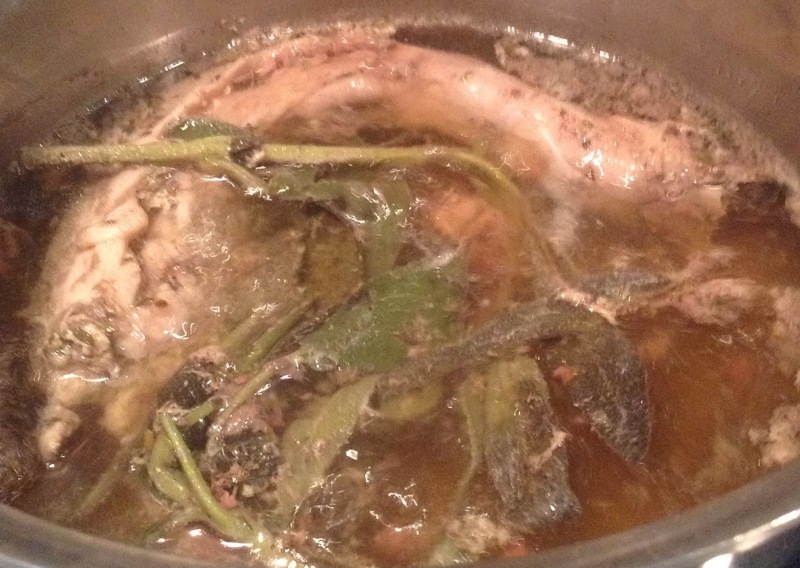 The giblets, salt, pepper, sage and enough water to cover went into my four quart stock pot. 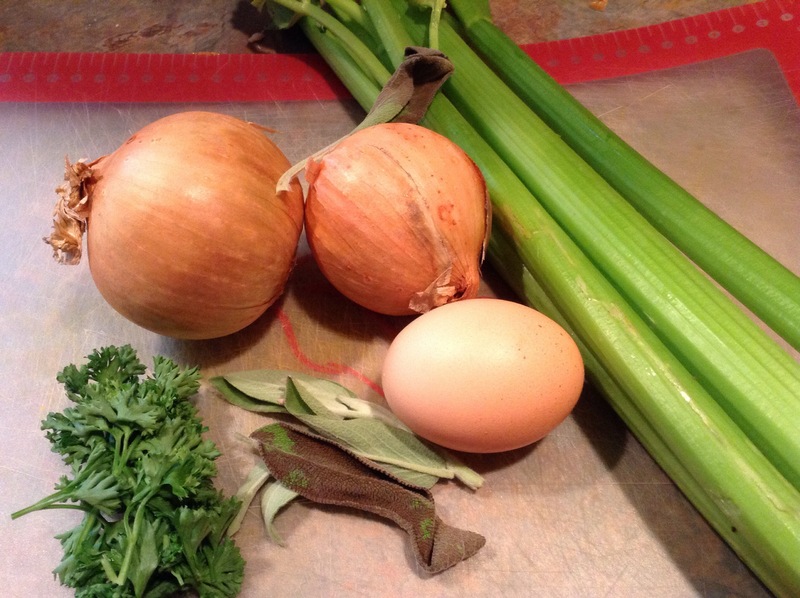 Once it came up to a boil, the heat got turned all the way down to low and the giblets simmer. Once the giblets are nice and tender, strain and reserve the broth. This will be the base for the gravy. Finely chop the giblets and add them to the broth. Add in some of the turkey drippings and stir together. Whisk in a few tablespoons of flour and continue whisking until gravy is desired consistency. Season with salt and pepper to taste. 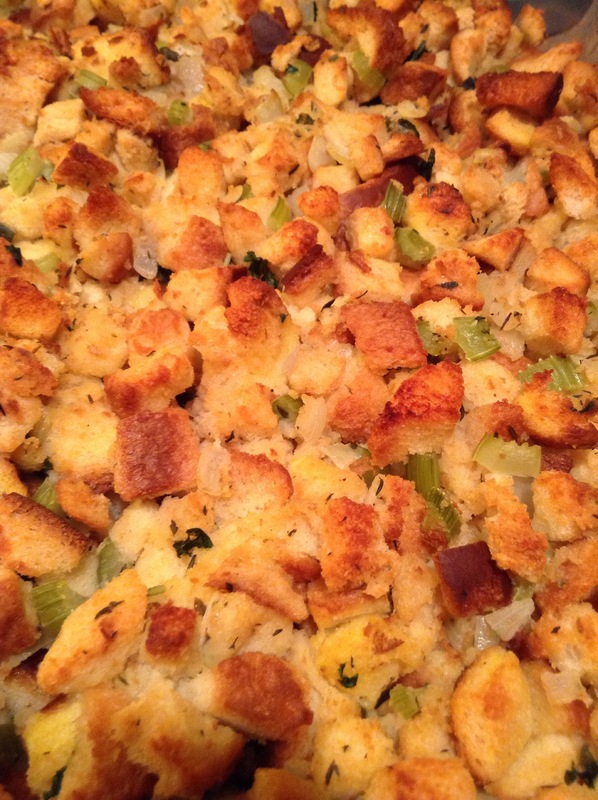 One of my favorite parts of the Thanksgiving meal is the stuffing. What do you call it? Stuffing, filling or dressing? This was kept very traditional. About eight cups of bread cubes are needed. Rough chop two onions, five stalks of celery, five sage leaves and a handful of parsley. 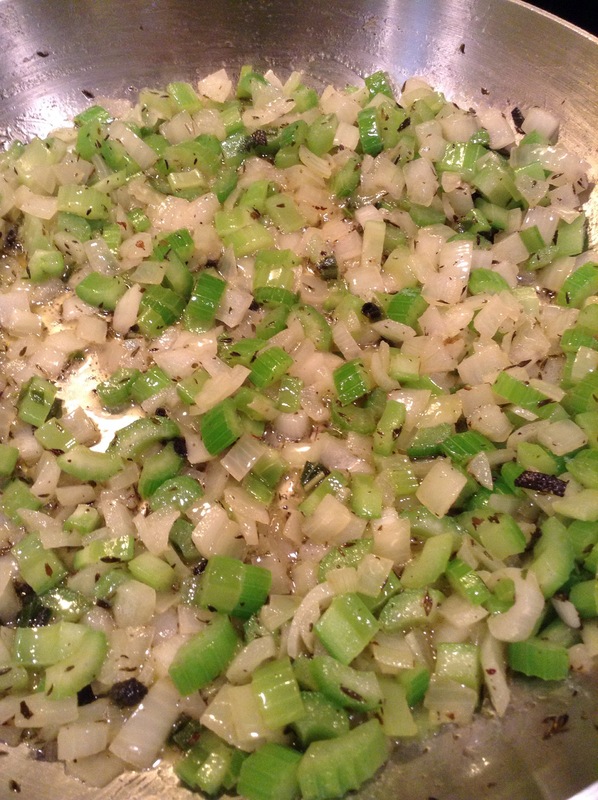 Sauté until tender in a few tablespoons of dairy free butter. The house will smell like Thanksgiving right about now. To me, nothing smells more like Thanksgiving than sage. Combine with the breads cubes and season with a few pinches of sea salt. Beat one egg and gently fold in. Place into a baking dish and bake at 350* for forty minutes or until nicely browned. You want the top to be slightly toasted. 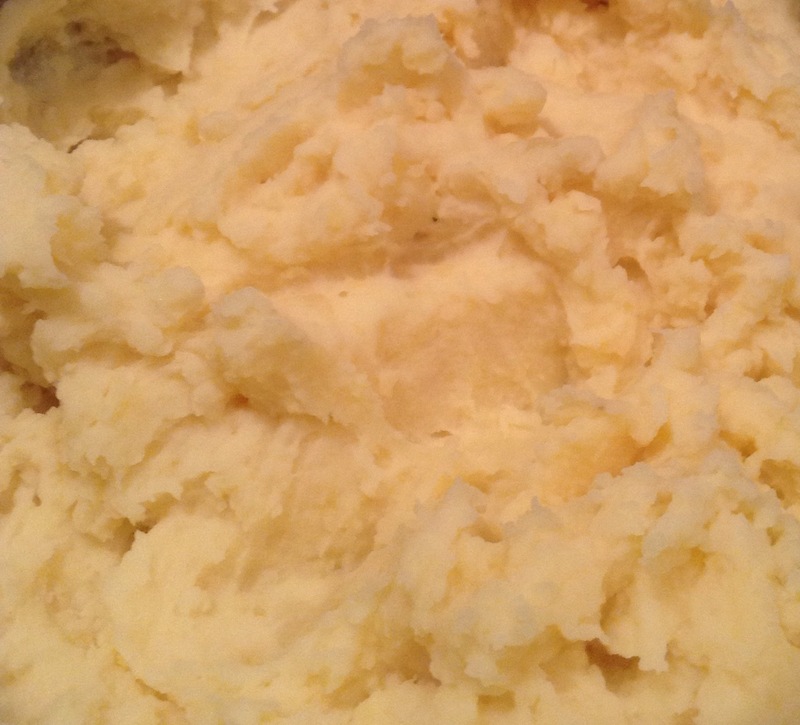 Next for the mashed potatoes. 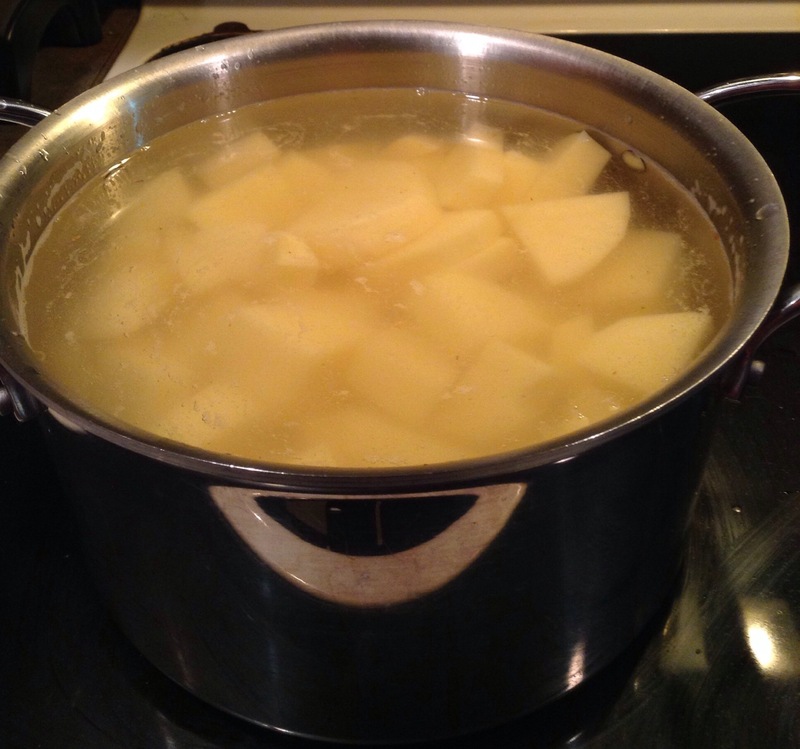 Six russet potatoes, peeled and cubed go into a four quart stock pot with enough cold water to cover. Boil until fork tender. Add in dairy free butter, dairy free sour cream and chicken broth until they are the consistency you are looking for. 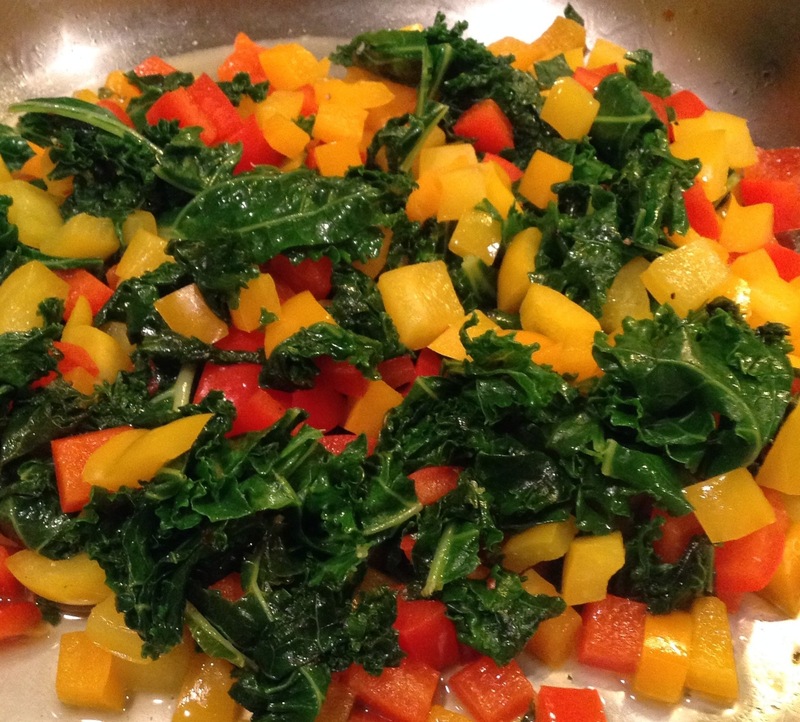 The last dish for our Thanksgiving dinner was kale with sweet peppers. This is the simplest dish by far. 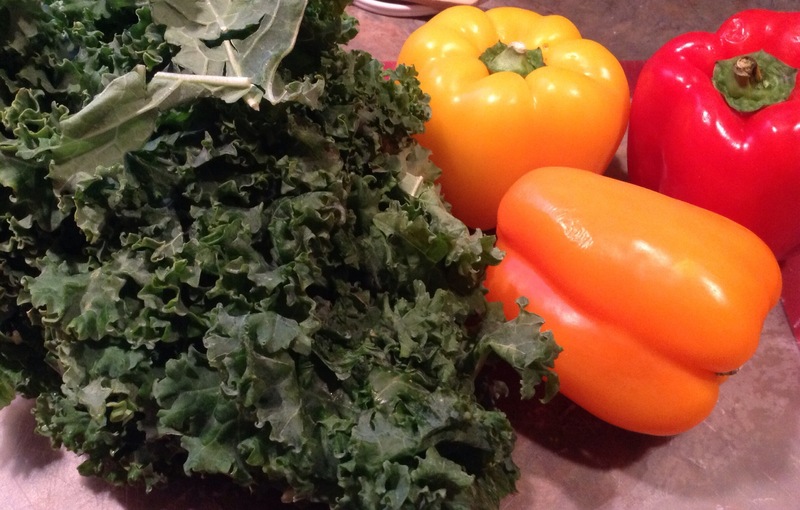 One bunch of kale and three sweet peppers sautéed in extra virgin olive oil. Since we eat with our eyes first, this dish has a lot of color. This is how we do Thanksgiving (Sunday). What are your Thanksgiving favorites? What flavors instantly bring the holiday to mind? One recipe? Two pumpkin products! Thanksgiving Preparation at our favorite Farmers’ Market! Nutritious food with a delicious taste! Cooking can be as much fun as Flying! where there's food, there's me!